The mere mention of OSHA fines and penalties is enough to make any forklift driver, safety supervisor, or HR personnel pay attention. You’ve probably heard a few stories about how OSHA fined a company millions of dollars, while other rumors suggest that OSHA penalties aren’t really a big deal at all. The truth, as usual, is somewhere in the middle. Plenty of rumors and gossip surround OSHA penalties, but figuring out the actual cost of workplace safety violations isn’t difficult. OSHA’s website has a detailed table that lists various penalties, which we’ll review in a minute. Paying costly OSHA penalties doesn’t have to happen at all. With training, employers and employees have the training credentials necessary to avoid expensive fines. What’s more, our convenient, online-based learning program is easily accessible for forklift drivers anywhere. If your organization has remote facilities and you need to ensure you workers are OSHA compliant, we ensure all of your employees are up to speed with safety training. Remember, driving without forklift training credentials isn’t just dangerous and potentially costly – it’s also against the law! If you’d like to avoid OSHA penalties and increase workplace safety, there’s one formula that always works: get trained with proven, professional courses! Training prevents accidents and injuries on the job. Let’s take a look at the costs associated with OSHA fines and penalties. OSHA conducts regular reviews of their fines and penalties. The actual dollar amounts don’t increase every year, but that is subject to change. The most recent update to OSHA penalties and fines occurred in August 2016, when the organization announced a new fee structure. 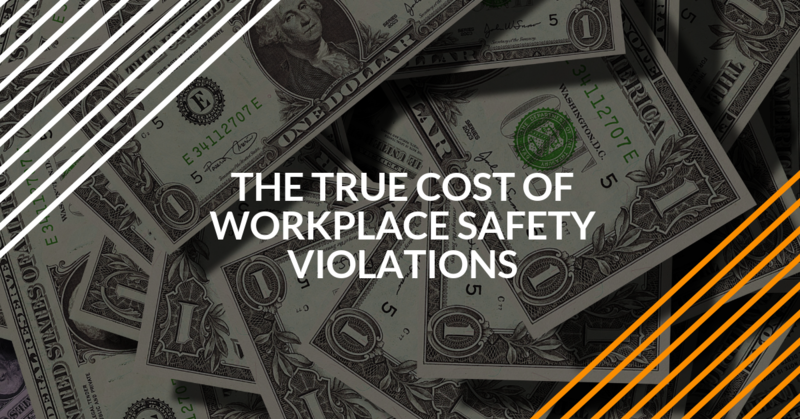 For the “true” cost of OSHA fines and penalties, here’s a scenario any company could face as a result of a forklift accident or related injury. Keep in mind, this is only the monetary fines associated with an OSHA investigation. With everything else surrounding an accident – possible additional legal fees, efforts to improve safety, training, compliance measures, and more – the impact of OSHA penalties goes far beyond anything a calculator can display. The “true” cost of OSHA penalties involves negative impacts to a company’s public image, ability to hire new employees, and much more. Non-compliance and untrained employees simply aren’t worth the hassle! What About Individual State OSHA Penalties? OSHA penalties are set at the federal level. However, some states have their own individual OSHA programs. State OSHA departments provide an extra measure of workplace safety for companies and employees. While state OSHA departments have their own audit procedures and have the ability to conduct on-site accident and injury investigations faster than federal OSHA authorities, there is some confusion about OSHA penalties for states with their own OSHA programs. According to OSHA, “State Plans are monitored by OSHA and must be at least as effective as OSHA in protecting workers and in preventing work-related injuries, illnesses and deaths.” Whenever federal OSHA penalties are adjusted, state OSHA programs have six months to match or exceed the federal benchmark. To learn more about individual state OSHA programs, visit the OSHA State Plans page, which offers tons of useful info on audits, contact numbers, local jurisdiction boundaries, and much more. Training Kit – basic safety concepts, advanced forklift operating information, and everything in between! Train a Trainer – this course gives your company a Certified Forklift Safety Expert to train other employees, work with OSHA, set safety guidelines, and more. Bundle Package – includes the Training Kit and Train a Trainer courses at a special discounted rate. The actual cost of our programs are only a few hundred dollars. Compared to the potentially crippling OSHA penalties you could face, our training is a wise investment – sign up today. For any questions about our training courses, call our OSHA compliance and training experts at (888) 278-8896.